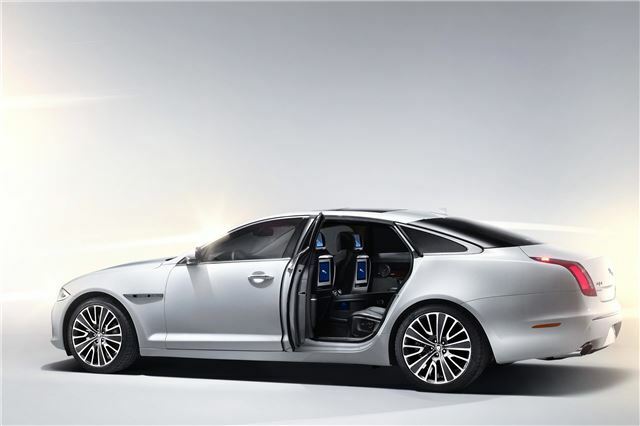 In unveiling its most luxurious XJ yet, Jaguar has introduced its new supercharged 3.0 V6 engine. The XJ Ultimate is a luxuriously appointed XJL with the appointments of a private jet in a package to suit a wide range of requirements. A full-length, leather-trimmed centre console separates the two individually tailored rear seats which feature power adjustment, ventilation, massage and lumbar functions. A table, machined from solid aluminium with piano-black and chrome detailing, rises up from the centre console at the touch of a button to provide a working area, its role supplemented by the provision of two third-generation iPads® with wireless keyboards that are housed in bespoke leather-trimmed docks in the rear of the front seats. The XJ Ultimate will be offered with Jaguar’s existing 510PS supercharged 5.0 litre V8 and turbocharged 3.0V6 diesel. The diesel returns fuel consumption figures of 40.1mpg (EU) on the combined cycle. The XJ Ultimate will also be offered with a new 3.0-litre V6 supercharged petrol engine being introduced to the Jaguar range for the 2013 model year. This engine in the XJ Ultimate will produce 340PS and 450Nm and offers similar performance to the naturally-aspirated 5.0 V8, but with the emissions and fuel economy advantages of a V6. The 3.0-litre V6 S/C will be offered in tandem with Jaguar’s Intelligent Stop-Start system and, in common with all powertrain options, will drive the rear wheels through an eight-speed automatic transmission. Road Test and Video of Jaguar XJL 3.0V6 diesel.